Bitcoin bulls have managed to push BTC above the key resistance point of $7,200 and maintain the price above $7000 for several days. Though this comes as welcome relief for the bulls some caution is needed. The CCI indicator is showing us a lower high on this push. This is not, in itself, indicative of a pending move down. The mix of low volume is concerning. We expect shorts to try to push the price of Bitcoin down below the resistance level in the short term. 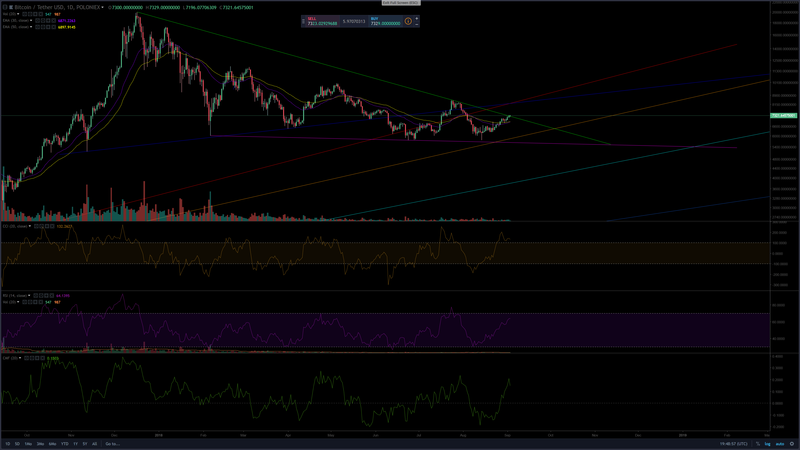 If the bears are successful we could see Bitcoin fall back to the $6100 support line where we will look for buyers to come in. If Bitcoin manages to hold above $7200 and closes a 4-HR candle above $7500 it is likely the bulls will push to the next resistance line of $8200. Currently the risk/reward is not in favor of a trade so we will wait for a more reliable set up before taking either Long or Short positions in Bitcoin. 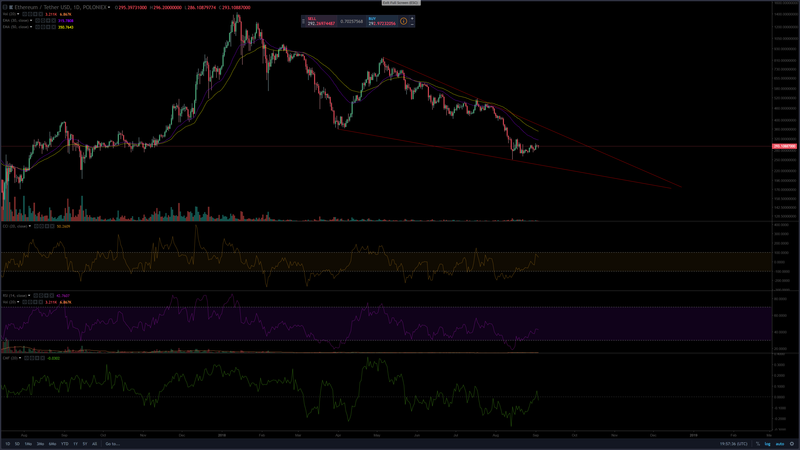 Ethereum has found itself in a large falling wedge since reaching and being rejected at $840. Though Ethereum is near the bottom of the wedge it does not present a reliable buy set up. We will look to open new positions in Ethereum once it is able to move above $330 and sustain for three days. This should provide us with enough risk/reward to enter a trade. On the downside a break down could see Ethereum fall to $200 before the bulls come in to defend this critical price level. The number three cryptocurrency by market cap continues to take a beating since it's peak of $3.28 in January and is currently trading at $0.34. 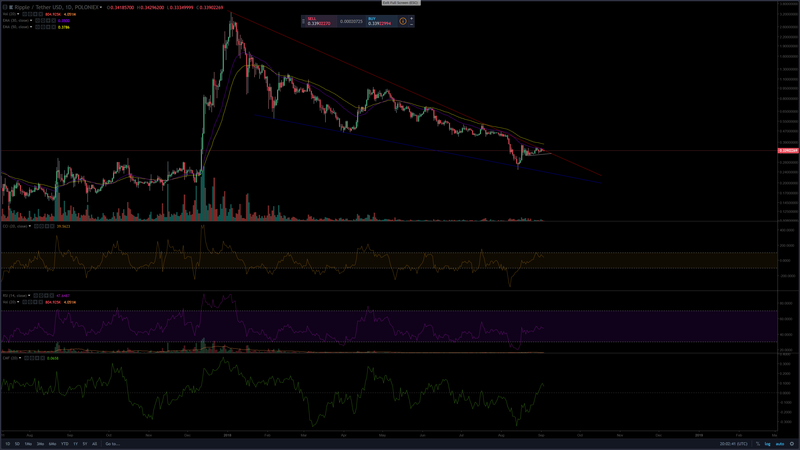 Though XRP is at the top of the falling wedge the risk/reward still does not favor a trade as XRP has been rejected, consistantly, at the 50-EMA as it has decreased in price. Without positive news this trend is expected to continue. 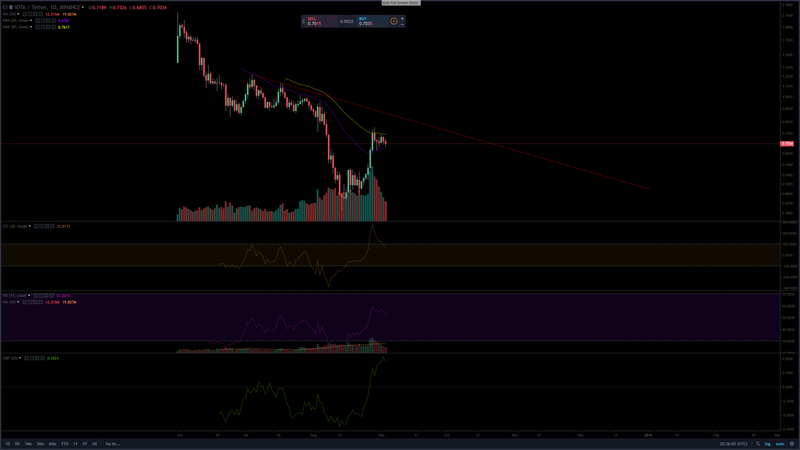 If XRP is rejected at the 50-EMA once more the expected target price for consolidation is $0.19 where it is likely buyers will come in and prop up the token. 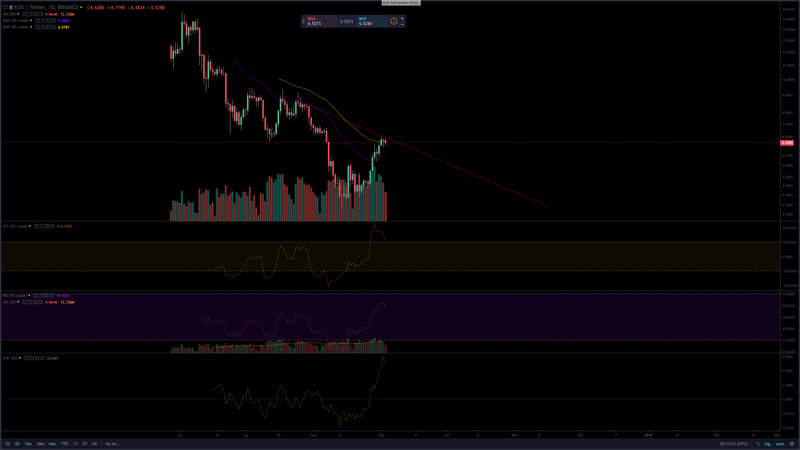 On the upside of XRP is able to move above the 50-EMA and sustain for several days it is likely to break up to $0.50 levels and to $0.65 from there. We will consider opening a long position if XRP is able to sustain a price above $0.44 for three days. With Bitcoin Cash developers in conflict over the future of the cryptocurrency we cannot recommend any trade at this time. Though it may trend inside the large falling wedge we do not expect any consolidation until the crypto approaches the $300 price point. 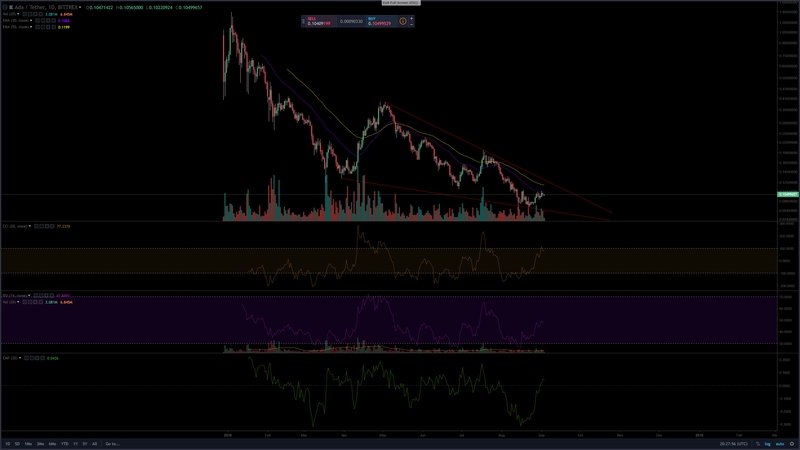 We will only consider a long position if Bitcoin Cash is able to break out of the falling wedge and sustain above $870. EOS has bounced and reached a peak price of $6.81. Here the bulls have appeared to run out of strength and the pair is expected to pullback to previous consolidation prices at $4.45. Traders should wait for new buying opportunities before entering any new positions. On the upside if the pair is able to break above $7.50 we will revisit and consider a long position. 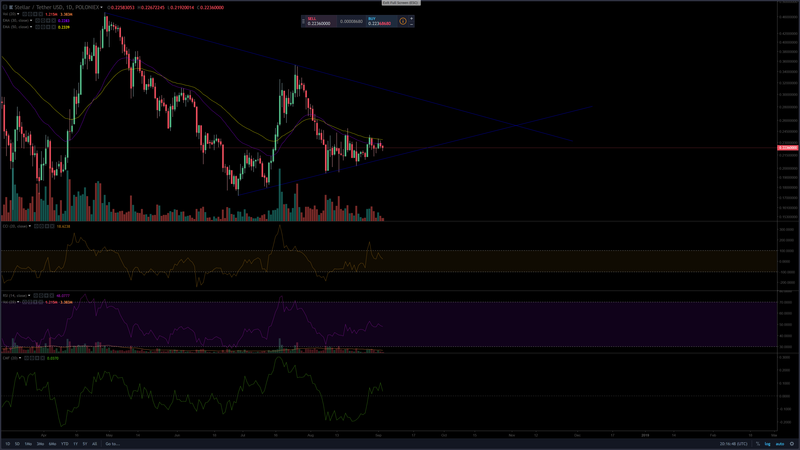 XLM continues to trend inside the large symmetrical triangle. As XLM, historically, tends to consolidate near the bottom of triangles we will wait to see if the $0.21 support level holds. If XLM bounces from the $0.21 we could see it move up test the resistance at $0.29. If the bulls break this resistance level it will likely lead to $0.35 from there. A break of the $0.21 support level is likely to see XLM fall as far as $0.09. 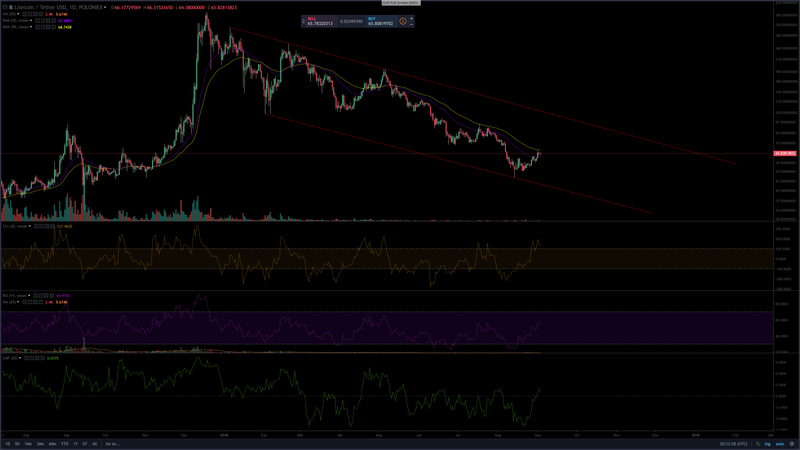 Litecoin is continuing down the downward channel it has been trapped in since it's peak of $370. As Litecoin tends to follows the movements of Bitcoin we will be looking for it to break above the 50-EMA to enter a long position. If the 50-EMA is broken Litecoin is likely to rally to the resistance level at $95. On the downside a rejection at the 50-EMA is likely to push Litecoin down to the next level of support at $42. 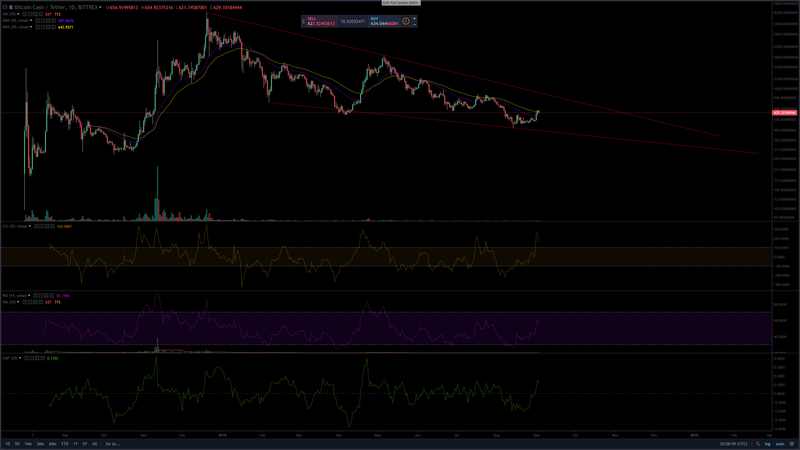 Cardano is another crypto trapped in a large descending wedge. 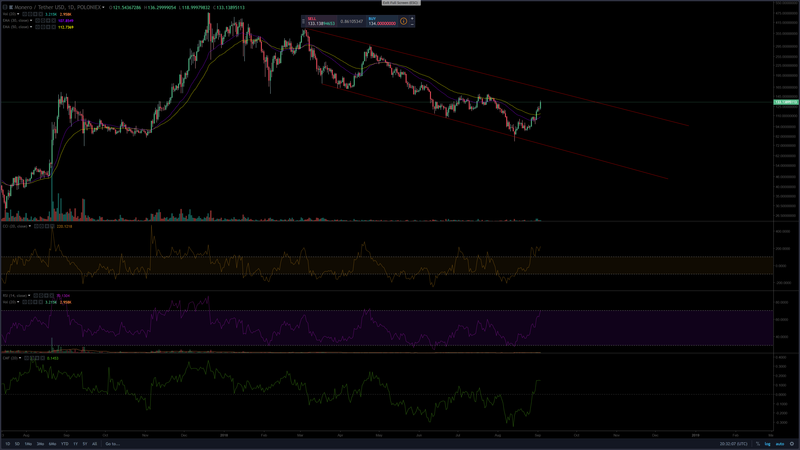 We will not consider a long position in ADA unless it breaks out of the descending wedge at $0.12 where the crypto is likely to rally to $0.19. On the downside a move will likely see ADA fall to support levels at $0.07 where we expect buyers to show up and push the cryptocurrency back toward the resistance line. XMR has jumped and broken above the 50-EMA. Though the indicators are showing us the cryptocurrency is overbought. We will consider longing the crypto if it breaks above the resistance at $153 where the XMR could rally to resistance at $295. Without a breakout above the $153 resistance XMR is likely to pullback to support levels of $68. IOTA rallied to a high of $0.80 but failed to break above the 50-EMA. As such a move back down looks to be likely and we will look for the pair to consolidate at $0.48 before attempting to make another push up. If the $0.48 is able to hold for three days we will consider longing the cryptocurrency as this will provide us with a reliable buy set up and risk/reward ratio.